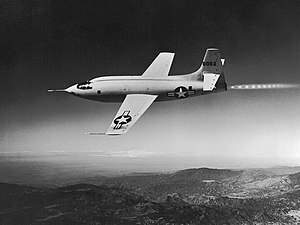 The Bell X-1 is a famous US jet aircraft. It was the first aircraft in the world that reach a speed of Mach 1 in level flight. It was the October 14th 1947. Its pilot was Chuck Yeager. X-1 #46-062, nicknamed Glamorous Glennis.